The sweetest antique Victorian three tiered skirt with a tiny pink and green rose print over a soft and a bit stretchy honeycomb net that is much nicer in person. The skirt has hook and eye closures in the back. FABRIC ~~ semi sheer linen with a mute rose print over a honeycomb net. MEASUREMENTS ~ ~~ 42 1/2" length, 25" waist, 38" hip. CONDITION ~ ~ Excellent antique condition. Much nicer in person. 1913/1914. The tiered look was very popular in the teens era. I really like how the seller shows the underlayer of netting - useful if anyone would like to construct a similar garment. 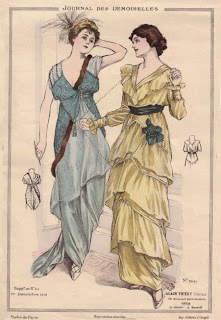 The above fashion plate shows a similar skirt from Dec 1913.